It seems to me that Zecco doesn’t have a clear plan on how to run their business. First, they asked a ton of paperwork to open an account, then ran a promotion with a lowered minimum requirement that didn’t want anybody to know, shortly after the secret promotion, they decided to get rid of all the paperwork for good and went even further to eliminate the minimum. It finally became a true free trading broker in June. At one time when I called them with questions about my account, I was told they were flooded by new applications. I guess they must be either exhausted by the processing or overwhelmed by customer calls complaining their trading system that they don’t want it any more because, less then three months after the elimination of the minimum, they reversed course and reinstall the $2,500 account minimum and scaled back monthly free trading offers from 40 per to 10 (details can be found on their website). Beginning next year, each qualified Zecco Trading account will get 10 free stock trades per month. Additional trades cost only $4.50, a deal we think is hard to beat. If you have more than one account of the same type (individual, joint, Rollover IRA, Traditional IRA, and Roth IRA), you’ll get free trades in the first account of that type. 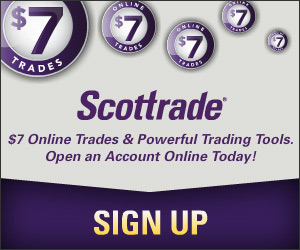 For your accounts applied for or opened before 12:01AM PST, October 1, 2007 you’ll continue to get 40 free trades a month, 10 free trades a day and pay $3.50 each additional trade until December 31, 2007. For options trades, you’ll pay $3.50 per trade plus 60 cents per contract till then. The new commissions kick in January 1, 2008. If you apply for or open a new account on/after 12:01AM PST, October 1, 2007, your new account gets the new deal from the start. The change won’t affect me too much before so far I only made three trades (two buys and one sell) and going from 40 free trades to 10 probably won’t change the way most Zecco customers trade as they claim that 98% of their customers made far less trades than offered. However, the back and forth does show how unpredictable Zecco is. I wonder what’s next. Maybe start to charge fees for trading? After seeing what they have done in the past six months, I can’t totally rule that out. I think it makes sense that Zecco has an account minimum. People shouldn’t be trading stocks with low account balances anyways in my opinion. “Free” was never a sustainable business model. I don’t know why anyone thought it would be. This was always an offer for rate-chasers. So companies change the Ts and Cs. What else is new! Does Zecco have an auto deposit plan where you can put money in an account each week/month? I need to sign up and start doing that. Are you going to stay with Zecco or look elsewhere? What do you think of sogoinvest.com? I was considering them if I left Zecco. I have no problem with companies changing their policy. It’s their business and they can change whenever they are pleased. However, the problem I have is how quick Zecco changed its terms. It seems that they don’t know what exactly they want to offer and whether the offer is too much or not enough. Michael: I have a very small account with Zecco (larger than the $2,500 minimum though). I always doubt if they can maintain the commission free structure, so I didn’t move much money to the account. I will probably keep the account. The change won’t affect me at all as I only do a small number of trades. i remember reading an article and i think it was an interview with one of the zecco officers that zecco will be the next youtube or the next myspace. basically they want zecco to be like social network for investors big or small. i think with these recent changes, zecco will just be another sharebuilder. I think it is natural for a company to tweak a new business model. I have had an account with Zecco for over 6 months and have over $40K in the account. The change to 10 free trades a month will not matter as I make less than 10 trades a month. I plan to keep my Zecco account and continue to get free stock trades. business survive on quality of thoughts,policies,etc.that may be free or something like that.i have examples who run his business having free account or free membership pro grammes.so be leader of thoughts and implementation. wow i was about to try them out and your post changed my mind. Thanks a lot for this. Not that what you said was negative — it just rang a bell with me. I’m not too comfortable about policy changing like that. I also took note of your comment that they sounded overwhelmed with new applications… maybe they’re having growing pains too?